Mouldings are manufactured from plaster, reformed wood, plastic, or milled solid wood and are used to cover alterations between surfaces and for decorative purposes. They provide an elegant look to ceilings, doors, windows, and cabinetry. Those with beveled edges are called ‘sprung’ mouldings. There are several types of plain moulding, like beading, pearling, casing, rosette, fluting, and the most popular one – crown. Moulding is often used in many parts of homes to enhance the rooms appeal. Moulding adds character, personality and charm. Moulding can cleverly be used to make a room appear larger. 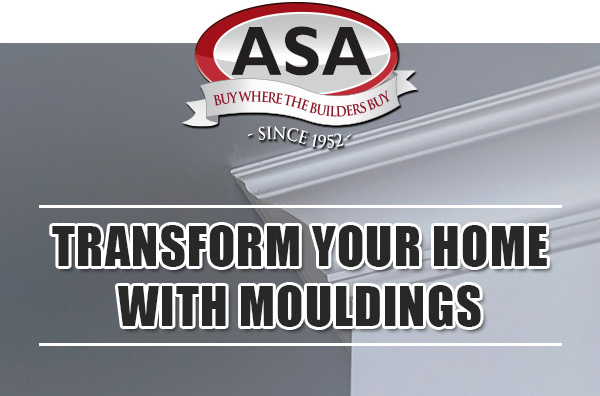 Ready to transform your home with moulding? Contact ASA Builders Supply to learn more.